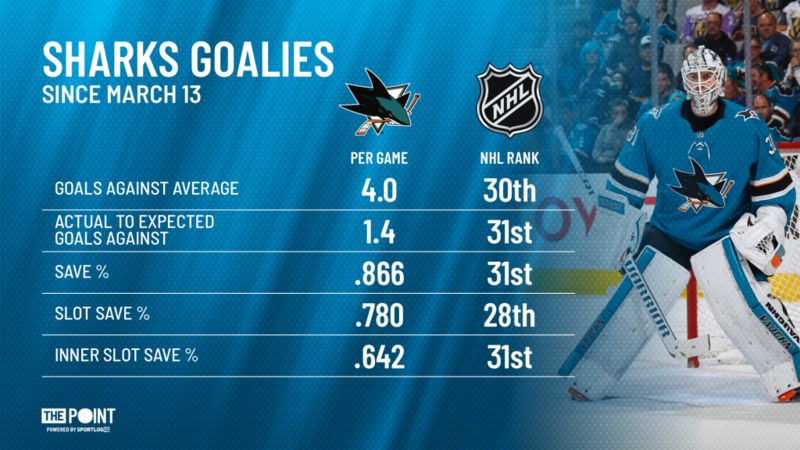 Can Martin Jones Find His Game in Time For Playoffs? - The Point Data-driven hockey storytelling that gets right to the point. 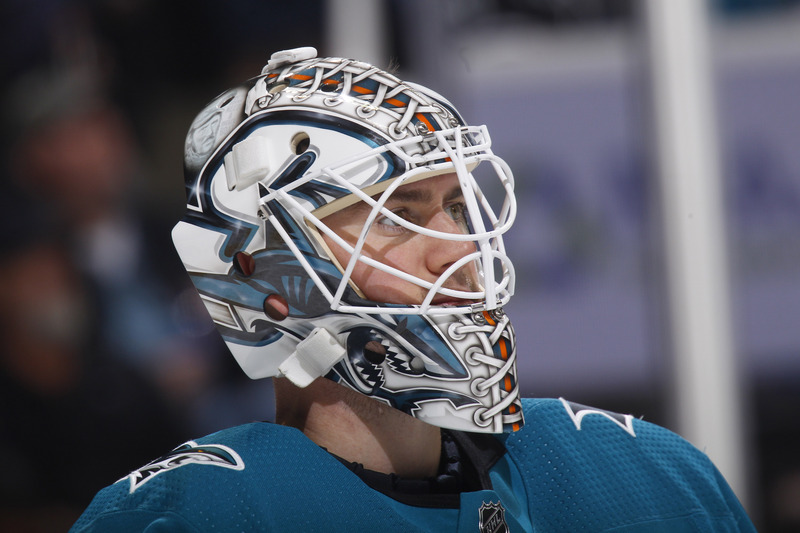 Can Martin Jones Find His Game in Time For Playoffs? Just a few weeks ago on March 12, the Sharks were riding high. Winner of six straight games, they were top of the Western Conference, one point ahead of the Calgary Flames. That’s when the wheels came off. San Jose won just one of its next nine games, losing ground to the Flames at the top of the West and missing its chance to clinch the conference and draw the second wild card team as their first-round matchup. Instead, they will go head-to-head with the Vegas Golden Knights in a rematch of last year’s second round battle that Vegas won in six games. During that 1-7-1 stretch, goaltending has let them down in epic fashion. In nine games, the Sharks allowed four or more goals seven times, although that total includes a couple of empty-netters. Unsurprisingly, they’re on the wrong end of the leaderboard in several goaltending statistics. On average, Sharks goalies have allowed roughly one and a half extra goals per game, relative to league average in this stretch. This is a major concern heading into the playoffs for a team that has serious Stanley Cup aspirations. Martin Jones has shown he can be a top-tier goalie, however, looking at how he stacks up against the other 15 projected playoff starters (teams currently in playoff spots), San Jose would be at a disadvantage in this area against any opponent. Despite having one of the league’s best defensive corps in front of him, that includes a pair of Norris winners, Jones has struggled to find his game and time is running out with the playoffs a little more than a week away. As it stands, Jones is the only projected playoff starter (or one of two if Calgary decides to go with Mike Smith) to have a positive actual to expected goals against, costing his team goals against compared to league average goaltending. The Sharks’ offense, ranking 4th in the league, has been powerful enough to compensate for less than stellar goaltending during the regular season. However, playoff hockey is a different animal and no team currently in a playoff position has allowed more goals against than San Jose. This does not bode well against Vegas as the Golden Knights boast the 6th-best offense since adding Mark Stone at the trade deadline and have Marc-André Fleury, who knows a thing or two about playoff hockey, in net. 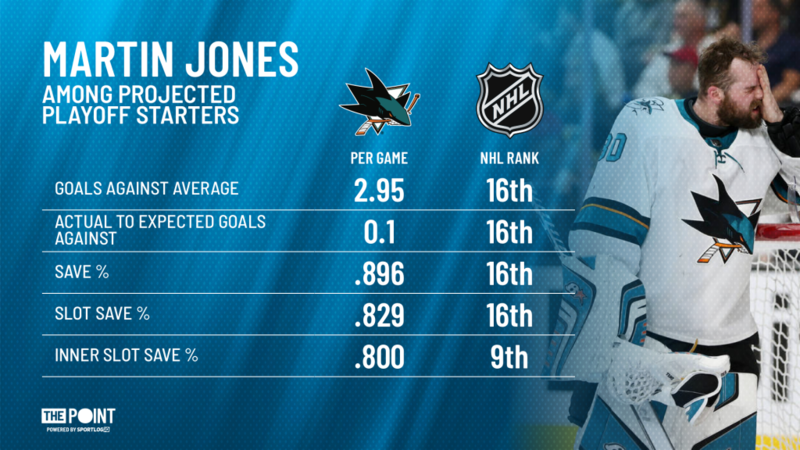 Unless Jones bounces back in similar fashion to Braden Holtby last season, the Sharks’ playoff run might be short-lived.